Links to our threads on the book and film versions of The Da Vinci Code. Columbia has formalized a February start in Europe for "Angels & Demons," the Ron Howard-directed sequel to "The Da Vinci Code" that will be released in December 2008. Producers Brian Grazer and John Calley, Col, Howard and writer Akiva Goldsman are seeking to finalize the shooting script before next week's deadline. Meanwhile, the "Angels" team have begun casting around Tom Hanks, who will reprise his role as Robert Langdon. . . . Hanks' character, a Harvard-based expert on religious symbols, this time sleuths a mystery that involves a secret society and a conspiracy that leads to Vatican City and threatens the future of the Catholic Church. If Ron Howard keeps this up, some people are going to regret using The Andy Griffith Show Bible Study in their Sunday school classrooms. : . . . and threatens the future of the Catholic Church. I'm wondering if any of the Catholics here could comment on this. The premise of the book is that Vatican City -- and no doubt Rome itself -- is on the verge of being destroyed by an anti-matter bomb. The Tom Hanks character has to run all over Rome examining Renaissance and/or Baroque art to see what clues it can offer that might help the police find the bomb before it goes off. Oh, and this is all happening while the cardinals have met to elect a new pope. So, what would happen to "the Catholic Church" if the bomb DID go off? The pope is dead before the story begins, and pretty much all the cardinals from around the world would be killed in the explosion. But the Catholic Church would still exist all over the world, right? And presumably the surviving bishops -- which is to say, virtually every bishop in the world, since almost none of them would have been in Rome at the time of the explosion -- could figure something out from there. I don't mean to minimize the difficulty that the church would face if it found itself in such a situation. No doubt there would be schisms and whatnot as various groups follow rival sets of bishops, or whatever (just as we already have splinter groups that reject Vatican II, etc.). But it's not like the Catholic Church would END, right? I can see how the crisis could lead to very serious problems -- but not the end of the Church. For one thing, we have the Lord's promise on that. The Church does not need cardinals to carry on, only bishops. In such an extremity, the bishops of the world would be charged with choosing a new bishop of Rome (not necessarily a bishop in Rome, but a bishop with episcopal charge of Rome). It would be gravely incumbent upon the bishops come together with complete unanimity in order to ensure the credibility of the candidate. A worst-case scenario, comparable to the Western schism of the 14th and 15th centuries, would be if rival convocations formed and selected credible rival candidates each claiming to be the true bishop of Rome. The crisis would not be insoluble. The Petrine office is not a charism handed on directly from one holder to another, as episcopal orders are handed on from one bishop to another. Whomever the Church recognizes as the bishop of Rome is the successor of Peter. It is, though, not impossible that this could remain in doubt for many years. Jimmy Akin on the possibility of a papal conclave disaster. Turns out there is no (known) contingency plan (which doesn't mean there isn't a secret one, but JA doubts it). Jimmy's analysis of what would probably happen is more or less what I figured, although he doesn't go into the worst-case scenario I mentioned. Sony's "Angels & Demons" has become the first major casualty of the ongoing writers strike. Studio said Friday that it is postponing production on the Tom Hanks starrer, which is a prequel to last year's megahit "The Da Vinci Code." Sources said the script, which was penned by "Da Vinci" scribe Akiva Goldsman, was rushed to meet the WGA's Nov. 1 deadline for reaching a new contract with producers, and came in with insurmountable problems. Furthermore, no cast had signed on beyond Hanks. . . .
Another coming project, "Angels and Demons," a follow-up to "The Da Vinci Code," represents something new for Mr. Grazer -- a prequel, the first his company has produced. Prequels and sequels are, of course, the ultimate safe bet in Hollywood, but he wants the approach this time to be less reverential than in "The Da Vinci Code." NAOMI Watts has scored a major role opposite Tom Hanks in "Angels and Demons," the prequel to the "The Da Vinci Code," which will also be directed by Ron Howard - but the production's start has been moved back due to the writers' strike. Across Europe, tension is beginning to build as the continent's largest studios contemplate a season without big-budget American productions to help fill soundstages. So far, the postponement of "Da Vinci Code" prequel "Angels & Demons," which would likely have shot in several countries, has caused the most angst. . . . Cinecitta deputy director Maurizio Sperandini is still waiting to hear what's going to happen with "Angels & Demons," part of which was planned in Rome locations and on his lot for six weeks between February and March. It was expected that "Angels & Demons" would also lense at Blighty's Pinewood, where "Da Vinci" was shot. . . .
Pinewood Shepperton has taken a hefty body punch from the writers strike, which has led to a major film to shut down production at the leading U.K. studios group. Pinewood announced the cancellation Thursday but declining to name the pic pulling out or why it had cancelled. Daily Variety's industry sources suggest the film is Columbia Picture's Tom Hanks starrer "Angels and Demons," the sequel to "The Da Vinci Code." . . . According to industry sources, Ron Howard's pic has already set up a production office at Shepperton and was gearing up for a winter set build leading to shooting at the studios in February 2008. The pullout forced the Pinewood Shepperton share price to nosedive by 7.55%. Price late Thursday afternoon stands at 245p, down 20p on Wednesday's closing price. . . .
Because it's set entirely in Rome, the Eternal City is a must-shoot location for Sony's "Da Vinci Code" sequel, "Angels and Demons," which rolls June 5. The soaring euro, however, and also Hollywood SAG strike fears, have limited helmer Ron Howard to just three tight weeks of essential exteriors in the Italian capital before retreating to Sony soundstages in Culver City. That said, the Roma & Lazio Film Commission is bending over backward to maximize the value of the shoot's dollars for producer Brian Grazer, hoping to sustain Rome's reputation in Hollywood as a film-friendly city despite the currently harsh currency factor. . . .
Israeli actress Ayelet Zurer has nabbed the female lead opposite Tom Hanks in Columbia Pictures' "Da Vinci Code" prequel "Angels & Demons." Ewan McGregor is in talks to join the thriller, which is based on the Dan Brown best-seller. McGregor is set to take on the role of a powerful Vatican insider who assists Langdon. Story centers on religious art scholar Robert Langdon (Hanks), who once again finds himself entangled with powerful forces with ancient roots: the Illuminati -- the most powerful underground organization in history -- and the Catholic Church. Zurer will play Vittoria Vetra, an Italian scientist who joins forces with Langdon. . . .
Ewan McGregor is in talks to square off against Tom Hanks in "Angels & Demons," Columbia's prequel to "The Da Vinci Code" being directed by Ron Howard and produced by Brian Grazer and John Calley. "Angels" sees Hanks reprising his role as symbologist professor Robert Langdon who tries to solve a murder and unravel a plot by an ancient group, the Illuminati, to blow up the Vatican during a papal conclave. . . .
Ayelet Zurer ("Munich") also is on board the production, playing Langdon's sidekick, a woman who is trying to uncover the mystery of her father's murder. . . .
Is the casting of Ayelet Zurer completely confirmed? She would be a terrific choice for the charachter of Vittoria, but I'm still reading in several places (including the Angels & Demons IMDb page) that Naomi Watts has been cast in the role. I just recently finished the book, which was far more enjoyable than I had expected, and I'm wondering if McGregor is actually old enough to play the part of the Camerlengo. BTW, the Hollywood Reporter story contains a major spoiler for those who haven't read the book. : BTW, the Hollywood Reporter story contains a major spoiler for those who haven't read the book. Eh? All the plot points would seem to come from the first act or so. Is it the word "
" that might tip people off? Photos from the set here and here. I haven't read the book, but from what I've read here it appears that Angels and Demons is more a straight-ahead espionage-type thriller than a "Jesus was not divine and the Church knows it but covers it up" type story like the Da Vinci Code was. Is that accurate? In other words, aside from some obvious Catholic church bashing, is there anything in the story that is clearly designed to deconstruct Christian beliefs? : I haven't read the book, but from what I've read here it appears that Angels and Demons is more a straight-ahead espionage-type thriller than a "Jesus was not divine and the Church knows it but covers it up" type story like the Da Vinci Code was. Is that accurate? In other words, aside from some obvious Catholic church bashing, is there anything in the story that is clearly designed to deconstruct Christian beliefs? If memory serves, the historical claims of this particular story -- that is, the claims which are germane to the actual plot -- really go back only as far as the Renaissance; the story revolves around the architecture of Vatican City and the works of art produced there and housed in various churches, and the book makes various claims about the Illuminati and their involvement in these things. I have no idea what sort of factual basis there is for any of these claims, and I suppose that some of them might be important to a Catholic audience member, but there's nothing there that Orthodox or Protestant audience members would care much about (except to the extent that we care about a film getting its historical claims accurate, period, of course). In the novel, there IS at least one bit where the Tom Hanks character recalls teaching a class where he made a claim about the origin of the Eucharist, but it's just a minor detail and it doesn't have any bearing on the story that I can recall, so I'd be surprised if it was included in the film. The claim, incidentally, is so nakedly ludicrous that it had me laughing out loud and blogging it pronto: Basically, the Tom Hanks character claims that Christianity borrowed the practice of communion from the Aztecs. The AZTECS! As if we Christians hadn't been consuming the Body and Blood of Christ for 1,500 years before we discovered the Americas. But like I say, that particular detail has no real bearing on this particular story, and I'd be surprised if the film included it in ANY fashion. , and I have no idea if this part of the story is rooted in fact or if Dan Brown just made it up, but I actually rather liked this bit. 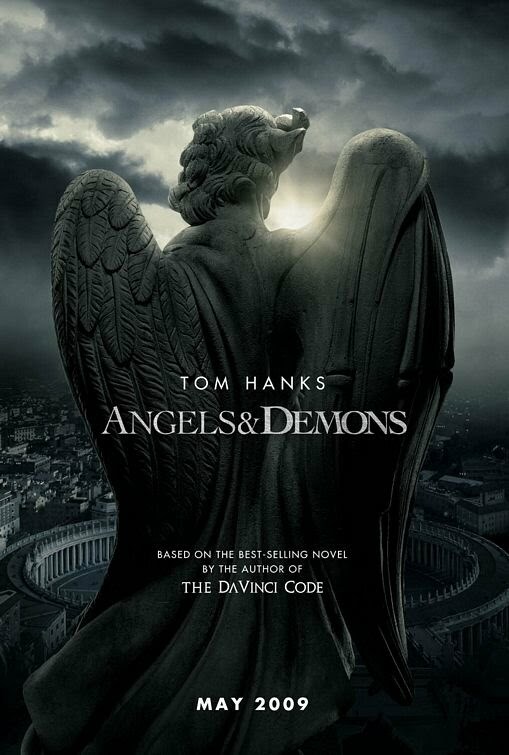 Rome's diocese said Monday it has barred the producers of "Angels & Demons" from filming in two churches for the prequel to the "The Da Vinci Code" the popular book and film that angered many Catholic leaders. Producers of the film, directed by Ron Howard and starring Tom Hanks, were turned down because the movie "does not conform to our views," said Monsignor Marco Fibbi, a spokesman for the diocese. Dan Brown Tourists: Next Stop, Rome? You know...that is a nice poster. Too bad it is for a movie I have zero interest in. It is a nice poster. And a remarkably perverse image, more creatively so than I would have given them credit for. By perverse, do you just mean the difference in the angel wing and the devil wing, or is there more symbolism included that I'm missing? Yes, I am referring to a single statue combining angelic and demonic traits (not just the wings; you can also see gargoyle features on the right side of the head -- a horn and pointed ear; the angel's side has flowing robes and locks, but the back on the demon side seems to be bared) looking down on St. Peter's Square. It strikes me as a graphic repudiation (not worked out like this of course, but in effect and out of confusion) of the traditional understanding of the absolute nature of angelic freedom -- and, on a deeper level, of the disparate and non-comparable natures of good and evil. A vision of good and evil as two sides of one coin, the dark and light sides of the Force. My instinct would be to say that such a statue is a profanity that has no place in a Christian setting, let alone Vatican City. I'm not dogmatic about that; it's an aesthetic opinion informed by theology, not a theological truth. USA Today has a couple of photos from the production available to view. In adapting the hugely successful Da Vinci novel, "I think we may have been too reverential toward it," (Brian) Grazer says. "We got all the facts of the book right, but the movie was a little long and stagey." In Angels, "Langdon doesn't stop and give a speech," Grazer says. "When he speaks, he's in motion." The Super Bowl spot: "He exposed one of the greatest cover-ups in human history. But what terrifying discovery would make the Vatican turn to Robert Langdon?" Just in case anyone thought the new film would let us forget the other one.